If your group is looking to embark on a one-of-a-kind sacred voyage, Canada’s charming French province Quebec is the perfect retreat. Quebec City, the capital, is one of the oldest European cities in North America. Since the colonization of New France, religious practices have played an integral role in Quebec’s history. Along with the cobblestone streets that lead to numerous chateaus and old stone buildings, you will find renowned shrines, cathedrals, and sanctuaries that date back centuries. 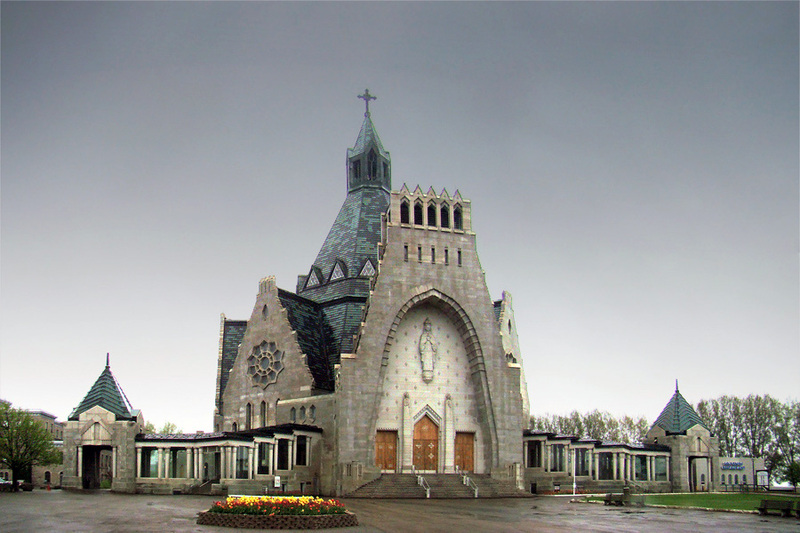 Dedicated to Saint Anne, the mother of Mary, grandmother of Jesus and the patron saint of Quebec, the Shrine of Sainte-Anne-de-Beaupre is the oldest pilgrimage site in North America dating back to 1658. It is well known by the Catholic Church for where miracles took place and where many pilgrims who were ill or disabled left cured. Groups who want the entire historical experience can drive Route de la Nouvelle-France, where pilgrims began their first journey to Saint-Anne-de-Beaupre around four centuries ago. This route along the Saint Lawrence River also has 23 places to visit that include museums, heritage houses, and chapels. Built in 1647, the Basilique-Cathédrale Notre-Dame-de-Québec is now a historical monument located in the historic district of Old Quebec. Between 1650 and 1898, around 900 people were buried under the cathedral and in 1923, a crypt was added. Bishops, archbishops and cardinals from the Quebec diocese are in the historic crypt along with four governors of New France. To the left of the cathedral, groups can read passages from the Holy Bible at the Pilgrim’s Garden. Inside the garden is The Holy Door Experience, where during Jubilees or “Holy Years,” people may pass through the door for a spiritual experience that allows them to collect lost parts of their lives. 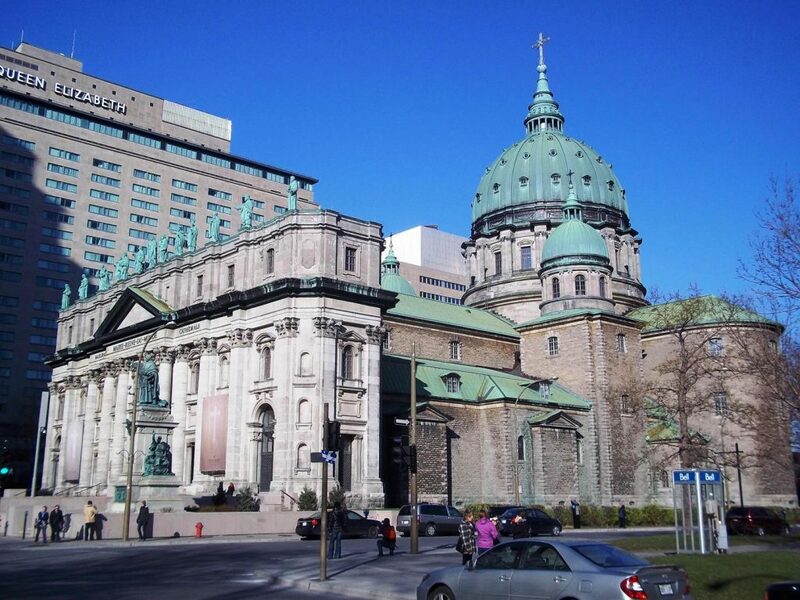 Located in the heart of Montreal, this Roman Catholic minor basilica is Canada’s largest church, holding the record of the largest dome in the world. On its 100th anniversary, it was named a National Historic Site of Canada. With gardens, museums and concerts, there is much to do. During the warmer months, groups can peacefully meditate in The Garden of the Way of the Cross, a great place to gather and relax in nature while surrounded with striking sculptures. The Oratory Museum, located on the fifth level of the Basilica, sheds a light on religious art from cultures around the world. While groups are there, they can check out the abundance of Nativity Scenes, also known as a creche collection, that they are famous for. Along with pleasures for the eyes, the Oratory also has music that will please your ears. For the past 50 years, the Beckerath organ has hosted concerts every Sunday, inviting many guest artists. One of the third largest shrines dedicated to the Mother Mary in North America, the Sanctuaire Notre-Dame-du-Cap attracts more than 430,000 visitors annually. With beautiful stained glass, a garden that looks over the St. Lawrence River and a spiritual peace that resonates through the entire grounds, there is much to look forward to. Located between Montreal and Quebec City, groups can expect to experience anything from fun guided tours, cultural events, concerts and much more depending on the time of the year. Located on the wooden shore of Lake Ouiatchouan, Ermitage Saint-Antoine is sought after by travelers from all over the country for its pristine tranquility. Founded in 1907, this national shrine offers amenities including the option to stay on the premise in a chalet, hotel, or even the option to camp. Guests can also satisfy their appetite with the on-site restaurant Le Campanile, enjoy a hike up the observatory tower or view a world-class multimedia show. Groups are encouraged to check out the guided tours, heritage buildings, museum, works of art and the serene walking trails. Admired for its remarkable interior architecture, the Notre-Dame Basilica of Montréal was Canada’s first Gothic revival church. Inside, you will see hundreds of wooden carvings and a variety of religious statues. However, unlike most churches, the stained-glass windows don’t depict the biblical story but rather the religious story of Montreal. 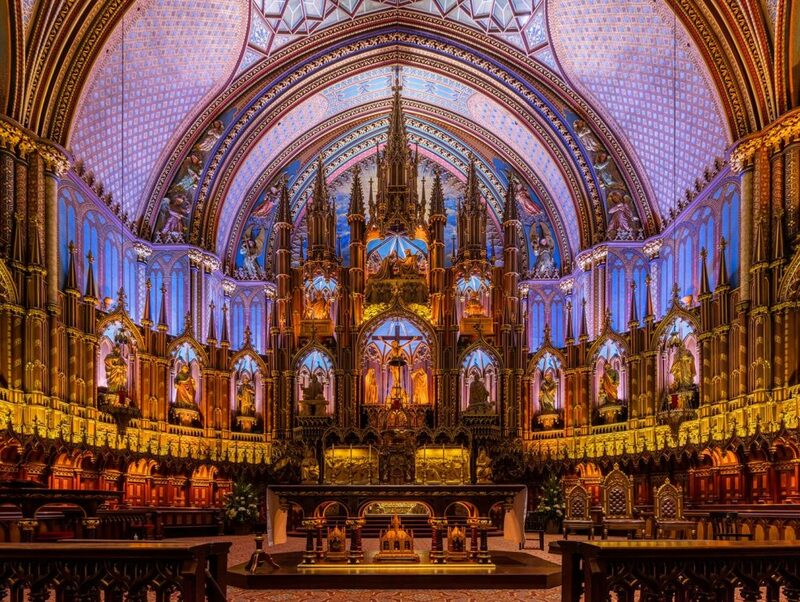 Hosted within the Notre-Dame Basilica, groups can experience Aura. A combination of lights and music that encompass the beauty of the art while also celebrating it. Another National Historic site of Canada, Basilique-Cathédrale Marie-Reine-du-Monde was built in the 19th century and is a smaller replica of Rome’s St. Peter’s Basilica. Under the dome is another replica of the famous “baldacchino” or Bernini’s baldachin. The cathedral is the third largest church in Quebec, and is home to the Roman Catholic archdiocese of Montreal. Groups can discover Montreal’s history that is portrayed through the many paintings throughout. After the Battle of Quebec in 1690, the church received its new name Notre-Dame-de-la-Victoire from its original dedication to l’Enfant Jésus. Founded in 1687, this church is the oldest in North America. In 1855, the church was also given the title of a Marian sanctuary, adoration of the Mother Mary. Every year, visitors can participate in the celebration of St. Genevieve by cooking little balls of bread. On January 3, the feast day, the priest blesses the little breads of St. Genevieve before they are given to people during the year. This is to symbolize the trust in God and the sharing with the poor. Built in 1771, Montreal’s charming oldest chapel Notre-Dame-de-Bon-Secours awes not only visitors, but generations of Montrealers every year. Known as the Sailors’ Church because of the model ships that hang from the ceiling, this is also the resting place of Saint Marguerite Bourgeoys, the founder of the chapel, Montreal’s first school and the Congregation de Notre-Dame. Groups can visit the Marguerite Bourgeoys Museum to celebrate the life of the saint and to honor the early history of Montreal. The crypt located underneath the chapel is now an archaeological site accessible for visitors.